Is it a tragedy to die young? Most people would say ‘yes’. When we hear of a 20 year-old dying in a car crash, we can’t help but be struck by the tremendous sense of loss. They were deprived of a future; they didn’t get a chance to do the things that make up an ordinary human life. When we hear of a 93 year-old dying, we are less perturbed. The death may still be deeply upsetting to their family and friends, but the sense of loss is less profound. They had a ‘good innings’; they had a chance to make something of their lives. Although this is the standard view of premature death, there are those that dispute it. The ancient philosophical school of Epicureanism is probably the most famous example. Epicurus and his followers dedicated themselves to philosophically dismantling death-anxiety. They argued that the good life consisted in attaining a state of ataraxia (perfect contentment, free from all fear and anxiety) and that this could only be achieved once we rid ourselves of the fear of death. This, in turn, could only be done through correct philosophical training and reasoning. I have covered the most famous Epicurean arguments before. I have looked at Epicurus’s claim that death is ‘nothing to us’ because it is an existential blank, i.e. a state of non-being in which we cannot experience either pain or pleasure. I have also looked at the Lucretian symmetry argument, which claims that the state of non-existence prior to birth should be viewed in the same light as the state of non-existence after death. Each of these arguments has its strengths and weaknesses, but one weakness they both share is that they don’t address the problem that I introduced in the opening paragraph: the problem of premature death. If the arguments are successful, they may give reason to feel more sanguine about death at the age of 93. But they give no reason not to lament death at the age of 20. Different arguments are needed for that. The Epicureans were aware of this shortcoming and they did have different arguments for the problem of premature death. 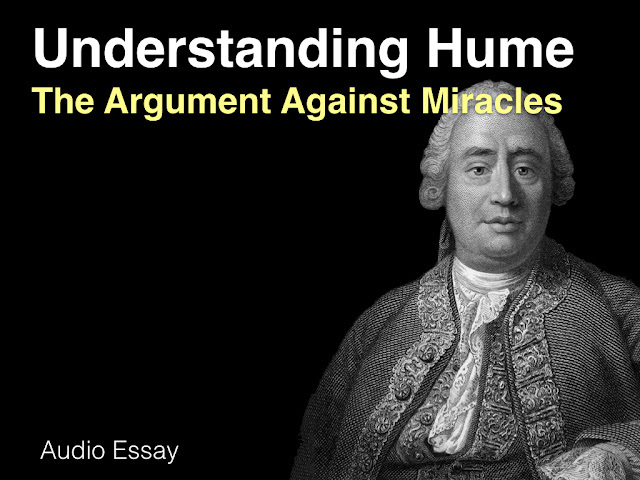 In this post, I want to review those arguments. I do so by following the excellent exposition of them in James Warren’s book Facing Death: Epicurus and his Critics (side note: this is probably the best book I have read on the philosophy of death; I highly recommend it). I’ll start by considering the arguments that can be mustered in favour of the common view — that premature death is a tragedy — then I’ll look at the Epicurean alternative, considering criticisms and weaknesses as I go along. As will become clear, my sympathies lie with the Epicureans, though I recognise that embracing their position has costs. To appreciate the dialectic that follows you’ll need to bracket one commonly-held belief: that death is always and everywhere a bad thing. Nothing that is said in what follows addresses that concern. We’re focusing solely on whether premature death is a bad thing. The other Epicurean arguments address themselves to the more general concern about the badness of death. So you can read the following as an exercise in suppositional logic. Suppose, for the sake of argument, that the Epicureans are right that death is not, generally, a bad thing. Are they, nevertheless, wrong in thinking that premature death is not a bad thing? The affirmative answer to that question can be defended in a number of different ways. One way — which I will call ‘accumulationism’ — holds that pleasure/well-being is something that accumulates over time. In other words, the more pleasurable experiences you have, the better your life is. Premature death is, thus, a tragedy because it prevents the accumulation of more pleasures. 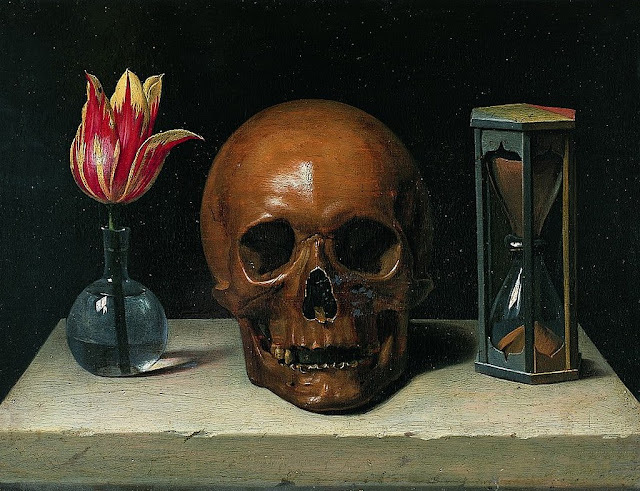 The problem with accumulationism, in the present context, is that it implies that death is always a bad thing because it always cuts off the possibility of accumulating more pleasures. It’s just as tragic for the 93 year-old as it is for the 20 year-old (though the balance of pleasure over pain may affect this to some extent). So we would have to modify the position to make it relevant to the debate about premature death, perhaps by arguing that there is some quota of pleasures that a ‘complete’ life would have. If someone dies before they meet their quota (before their life is ‘complete’) it is a tragedy. The problem with this modified view is that it is pretty difficult to determine what the quota is: it is, after all, notoriously difficult to quantify and measure pleasures. The best we could do is some rough and ready assessment, and that may not lead to the conclusion that death at a young age is always a tragedy. A 20 year-old could live a life of intense and continual pleasure, while a 93 year-old could live one of perpetual misery. In that case the 20 year-old has the more complete life and their death is less tragic. This is an important insight and it is worth dwelling on it for a moment. It suggests that the debate about the badness of premature death is less about the number of years lived and more about how they have been lived. Has the person lived a full life? Adding more years, in and of itself, is not necessarily a good thing; it’s the quality and content of the lived experience that matters. This insight is taken up by another way of defending the tragedy of premature death. This one focuses on the typical pattern of life, on what we might call its ‘narrative arc’. The complete life, we are told, passes through a number of stages. Shakespeare’s ‘Seven Ages of Man’ speech, from As You Like It is probably the pre-eminent expression of this view in Western literature (although it contains a good degree of cynicism and pessimism). It tells us that the typical narrative arc of life passes through seven distinct stages, from puking and mewling in your mother’s arms, to sitting in a slippered pantaloon waiting for oblivion. Other stuff happens in between. Taking inspiration from Shakespeare, we might hold that the typical narrative arc to life includes an educational/training phase, a mastery/success phase, a relationship/family-building phase and, eventually, a retirement/relaxation phase (some phases may overlap and run in parallel). 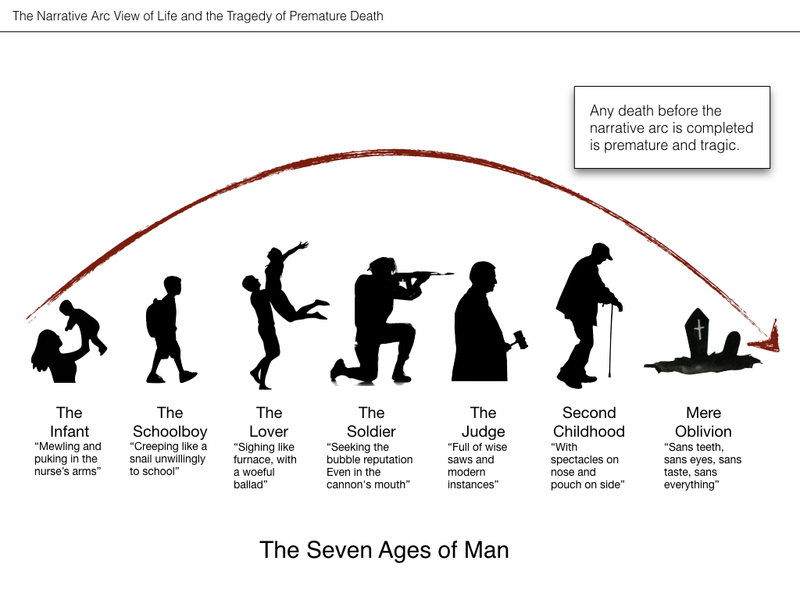 The tragedy of premature death arises from the fact that it prevents someone from passing through all the stages of the typical narrative arc. (1) Death is only a tragedy if it occurs before a life is complete. (2) A life is complete if it passes through the right narrative arc. (3) A premature death is one that prevents a life from passing through the right narrative arc. (4) Therefore, a premature death is a tragedy. Premise (1) derives from the Epicurean supposition (i.e. that death is not always bad) and from the preceding discussion of accumulationism. As you’ll recall, the conclusion reached at the end of that discussion was that the total number of years was not really what mattered but rather the quality and content of lived experience. I’m using ‘completeness’ as the concept that captures this idea. I do so largely because it is the concept that Warren refers to in his discussion, and is something that appears to have preoccupied the ancient schools of philosophy. Indeed, as we will see below, the Epicureans themselves accepted this premise: they just had a very different notion of what made for a complete life. Premises (2) and (3) are the ones that are critical to this particular argument about narrative arc. What can be said about them? Well, premise (3) is, in a sense, true by definition. Since we have abandoned the notion that prematurity is necessarily a question of age, it is now effectively being defined in terms of the incompleteness of a narrative arc, which is all that premise (3) says. This means that premise (2) is carrying all the weight in this argument, and I have two critical observations to make about it. The first is that the concept of the ‘right narrative arc’ is incredibly fuzzy. I mentioned the Shakespearean view as an illustration, but given the pessimism and cynicism implicit in that view, we might question whether it really presents a compelling vision of the ‘right’ narrative arc. If the idea is that one’s life should ‘tell a good story’, then we run into the problem that there are many different conceptions of what a good story is. Tragedies can be good stories. Wolfgang Amadeus Mozart’s biography has always struck me as being a good story. He packed a lot into his short life, even though it contained a degree of deprivation and struggle, and he left quite a legacy too. Was his life narratively complete, even though he died at the age of 35? I have heard some philosophers who really seem to think that narrative arcs that tell a good story are what ultimately matter, and that you should work on making your life story as entertaining and interesting as possible. It’s not necessarily bad advice (provided one bears in mind other moral duties) but it doesn’t provide much guidance on determining when and whether a death is tragic. It allows for quite a lot of pluralism and individualism. We cannot easily say that the death of the 20 year-old is tragic on this view. We would have to carefully examine the narrative arc of their life and consider the story it tells. A second observation follows on from this. Someone who was worried about excessive pluralism and individualism might try to impose a more objective, standardised view of what the narrative should be. The right narrative arc, we might be told, is a life of ‘three score and ten’ years, which consists in a childhood of play and education, an adulthood of careers, relationships and child-rearing, and a retirement of relaxation, travel and family. The problem is that any imposition of a standard narrative will risk seeming incredibly parochial and historically arbitrary. The narrative I just sketched, for instance, is a relatively recent model of the ‘typical’ life and is something that is challenged and resisted by many (e.g. why postpone retirement until old age? why not take mini-retirements when you are younger? why not look for more years?). Furthermore, there may be people who can cram most of what we expect in a life of ‘three score and ten’ into a shorter period. Imposing a standard narrative arc seems, consequently, like an unpromising way to shore up the argument. These strike me as being significant problems for the narrative arc view of life. I’m not saying that it provides no guidance whatsoever on what the complete life consists in; but I am saying that the guidance it provides is fairly limited. Furthermore, it doesn’t enable the kind of resiliency in the face of death that the Epicureans wanted to inculcate among their followers. If your own preferred narrative arc demands of lot of years — if you want to ‘fade away’ in old age rather than ‘burn out’ at the age of 27 — a premature death will indeed be tragic for you. Epicureans wanted you to be prepared for death whenever it might come. For if you have enjoyed the life you have led up to now and you have not allowed all those benefits to flow away and be lost without enjoyment as if poured into a broken pot, then why do you not leave like a diner fed full of life and find secure rest with an untroubled mind? Why indeed? Why can we not be ‘fed full of life’ and leave the feast with ‘untroubled mind[s]’? (5) The sole dimension of value in life is pleasure; or, to put it another way, the completeness of life is to be determined by its pleasurableness. (6) True pleasure is katastematic, not kinetic, in nature. (7) Katastematic pleasure does not accumulate over time; it only varies. (8) Therefore, once katastematic pleasure has been achieved, a life cannot be improved by adding more years to it. (9) Therefore, a life of katastematic pleasure is complete. (10) Therefore, death, after katastematic pleasure has been achieved, is not a tragedy (from (9) and (1) from the previous argument). Premise (5) is a strong claim but it is a key commitment of the Epicurean view. You might dispute it. It certainly feels a bit off to me. I think that there is more to life than pleasure alone, i.e. that there are more dimensions of value at stake. For example, I think there are moral and scientific values that have nothing to do with pleasure, per se. It is important, for example, to discharge one’s moral duties to others, to care about their well-being and welfare. This is a dimension of value that seems to be obscured to the Epicureans. On the face of it, they seem to tie themselves to a crass form of egoistic hedonism. It becomes less crass when we consider their definition of pleasure (premise 6), but the egoism doesn’t go away. This is something that gets Epicureans into trouble at other times. For example, in the last chapter of his book, Warren discusses whether it makes sense for Epicureans to write wills (Epicurus himself famously did) and argues that it doesn’t if they remain committed to egoistic hedonism. I tend to agree with this critique and think a revised form of Epicureanism, shorn of its staunch egoism, would be preferable. Katastematic pleasure: The pleasure that arises from the absence of pain, want, need in life; i.e. a feeling of contentment/equanimity. …because what you want is always at a distance you shun what is at hand, your life has slipped away incomplete and unenjoyed, and death stands by your head unexpected, before you can leave things satisfied and full. How do we get out of the loop? Epicureans aren’t too helpful on this. They seem to think that proper study and familiarity with their philosophical teachings — as opposed to some meditative or ritual practice — will suffice (at least, that’s the impression I get from Warren’s book). This is something that differentiates them from the Buddhists and Stoics, who have a very similar attitude toward death and the good life (I covered the Stoic view on a previous occasion), but include meditative and ritual practices as a key part of the effort to attain equanimity. But we’re not looking for practical guidance here; we’re trying to investigate the logic of the Epicurean argument. Assuming that the distinction between katastematic and kinetic pleasure is accepted we can move on to the next crucial premise. Premise (7) claims that katastematic pleasure does not accumulate over time. In other words, it claims that your life doesn’t get more pleasurable by having more moments of katastematic pleasure. This might look like an odd thing to say. Surely someone who lived for 10 years in a state of katastematic pleasure would be better off than someone who only did so for a few hours? But it does make a certain amount sense. The state of katastematic pleasure is defined by the absence of certain qualities (pain, want, need) not by the presence of certain others (intense joy, mirth, laughter). It is, in a sense, a ‘zero state’: one in which harmony and balance is achieved. As such, it makes sense to say that katastematic its not something that gets better the more of it that you have. Indeed, one of the defining characteristics of katastematic pleasure is the absence of the desire for more. That said, Epicureans acknowledged that katastematic pleasure could vary over time, i.e. you could experience slightly different forms of it in different contexts. This variation, however, did not make life better. Warren thinks that there are certain problems with the idea that katastematic pleasure does not accumulate. The obvious one is this: if you achieve a state of katastematic pleasure, does that really mean that death, no matter how soon after the state has been achieved, is never a tragedy? What if it comes two seconds after such a state is achieved? To say that death at this point is not bad or premature seems logically obtuse and, indeed, was something that some Epicureans resisted. As Warren notes, many of them appear to have adopted a moderate stance, according to which some reasonable period of time in a state of katastematic pleasure was required (perhaps just enough to show that it was a stable state, not a fleeting one). If you include such a requirement, the argument outlined above would need to be modified to talk about ‘stable’ katastematic pleasure or ‘reasonable periods’ of katastematic pleasure. If you accept that katastematic pleasure is true pleasure, and that once attained (for a reasonable period of time) it cannot accumulate, it is plausible to then infer that your life is complete: that it is not going to get any better by adding more years. The rest of the argument might then succeed. Death once katastematic pleasure had been achieved cannot be a tragedy. This gives us some guidance on how we should react to the death of a young person. We should ask: did they achieve katastematic pleasure? Were they content and free from want, need, anxiety? That will determine the tragedy. As I mentioned in the introduction, I am sympathetic to the Epicurean view. But there is some wishful thinking embedded in this sympathy: there is a sense in which I want to believe it because it tries to prepare us for, and reassure us about, the inevitability of death. Given that we are all going to die (and it is worth noting that I think this is always going to true, even if we manage to greatly extend our lives through the use of science and technology) it makes sense to face its reality. Epicureanism is one of the few philosophies that (a) doesn’t deny or ignore death and (b) offers solace or consolation in its face. It would be nice if it were philosophically tenable. Furthermore, I think the Epicureans get something fundamentally right in their understanding of true pleasure. It is dangerous to be trapped on a hedonic treadmill, constantly seeking more and more pleasurable experiences. You will never be satisfied. Admittedly, Epicureans aren’t the only school of thought to make this point, but I appreciate their way of framing it. That said, there are costs to accepting the Epicurean view. For one thing, an Epicurean life would not appear to be a recognisably human life. If we were all fully committed to achieving katastematic pleasure, and completely inured to the idea of our own deaths, it seems like we would have to become remarkably detached from the ordinary pleasures of life. The narrative arc view, outlined above, at least has the benefit of working with (not against) widely held beliefs about what makes for a good life: engagement with the world, with other people, with family and friends, with ambition and hope, and so on. The Epicurean life seems to warn us against these things. If we become too attached to worldly affairs, we risk losing the requisite equanimity and contentment we need to avoid death-anxiety. As an illustration of this, Epicurus famously urged his followers to withdraw from political life. At the very least, Epicureanism would appear to require a significant shift in our attitudes towards worldly affairs. Maybe we could still do some of the things that make up a recognisably human life, but we would have to do them with a little less vim and vigour, and a little more philosophical distance. This is a criticism that has often been targeted at similar philosophical positions, such as Buddhism. Furthermore, there are paradoxes and tensions in the Epicurean view. As we have already seen, Epicureans actually do accept that premature death can be a tragedy. They just happen to have a very different understanding of prematurity. Their understanding makes sense, given their other beliefs, and is philosophically consistent, but it doesn’t completely eliminate all anxiety about premature death. There is still a tragedy of dying before katastematic pleasure has been attained. Warren thinks that this leads to something of a paradox for the Epicurean. On the one hand, they think that the key to living a pleasurable life is to rid oneself of death-anxiety; on the other hand, they seem to imply, through their analysis of premature death, that death-anxiety is rational before you have attained true pleasure. There is a chicken-and-egg quality to this: you need to rid yourself of X to have true pleasure but X is rational before attaining true pleasure. There may be ways to resolve this paradox. Perhaps some people are lucky enough to never experience death anxiety and so can achieve Epicurean equanimity before the problem arises. Also, perhaps you can rid yourself of death anxiety indirectly — i.e. not through rational philosophising but through meditative practice. This is, however, not something that Epicureans seem to have endorsed. In any event, more work needs to be done on the implications of Epicureanism for the rest of one’s life. I will close by simply repeating that I find something attractive about it, despite the complex reevaluations it entails.